for a youthful glowing complexion. To have a clear skin, free from wrinkles & spots is every woman’s ultimate desire. Gold can activate the basal cells of the skin, which increases the elasticity of the skin. It thus reduces wrinkles, fine lines, blemishes, and marks on the skin, and will make you look younger. Gold is said to have anti-bacterial and anti-inflammation properties that help oxygen to enter into the skin for renewal of the cells. This helps in treating ulcer and other inflammatory disorders of the skin. It is also known to rejuvenate your skin. The ions present in gold help in stimulating the cells, nerves, and veins in your body. This leads to improved blood circulation. This will increase the metabolism of skin cells and secretion of the waste. Gold can help to stimulate the cells and have a healthy skin. Gold helps in improving the blood circulation, hence it helps hydrate and maintain the skin’s moisture level. The small particles of gold get absorbed into the skin imparting a rich glow. This makes the skin healthy, fresh and radiant. Some time ago, in a small town southwest of Melbourne Australia, a young man was resting by a small creek when a glittering light caught his eye and changed his life forever. It was this discovery of gold in Ballarat that resulted in the world’s richest alluvial gold field to date. 167 years later, many have forgotten about the gold rush of 1850. However, the same family owned business and 3rd generation geologists are still thriving. Throughout the years alluvial gold has been used for many different applications, from jewellery to fillings and now skincare. 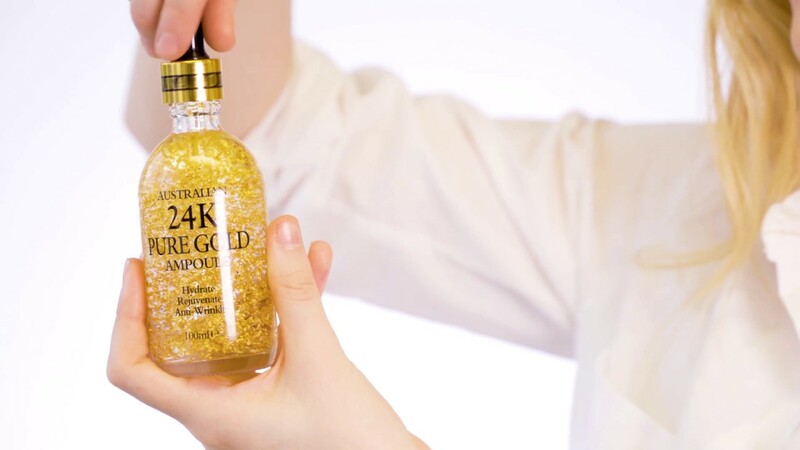 Unlike large gold nuggets, alluvial gold or “gold dust” are small, precious cell-renewing pieces of the 24k mineral which are easily absorbed by the skin. Gold helps in improving the blood circulation and as a result the skin’s moisture and hydration levels are maintained. Small particles of gold are absorbed into the skin imparting a rich glow, this makes the skin healthy and produces a glitter of gold effect. Scientific research has also proven the mineral can calm acne inflammation, reduce skin redness and protect against free radicals that lead to wrinkles and sun damage.